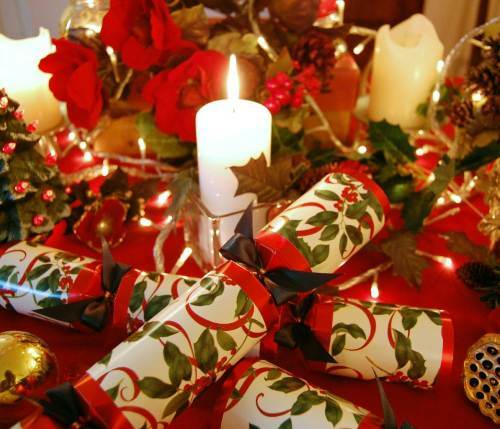 No festive dinning table would be complete without one of our greatest British traditions – Christmas crackers. Each year we all gather around and politely ask the person sitting next to us if they would pull a cracker. Then out floats the corny jokes, the even more tacky gifts and of course the unflattering coloured paper hats. 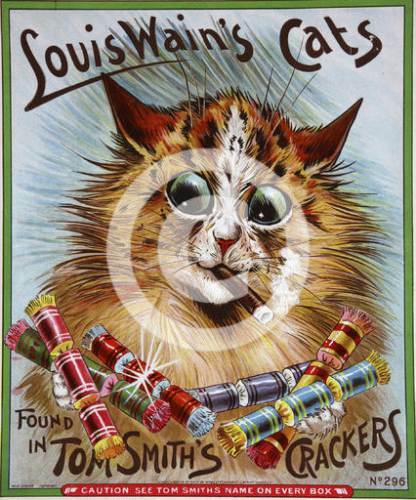 Whether this is a tradition you love or loathe collecting unused Christmas crackers is an explosive collectors market which would never have existed if confectioner Tom Smith hadn’t discovered a sugar coated sweet. Tom Smith discovered the ‘bon-bon’ (sugared almond) sweet whilst on a trip to Paris in the 1840s. Wrapped in twists of coloured paper he realised this sweet would sell well in London as up until that point most were sold loose in paper bags. Proved right the bon-bon was a renowned success but only over the Christmas period with the problem being sales virtually stopped once the festive season had come to an end. In order to encourage orders all year round Tom added a small love moto which he placed within the paper. Once again sales were most successful around Christmas so with this in mind Tom decided to develop his seasonal sweet wrapping and cash in. A flash of inspiration came one day after he had thrown a log onto his burning fire as a big crackle exploded from the log which made Tom jump. This sound was the necessary spark that he had been looking for in order to enhance his ‘bon bon’ and make it more desirable to the buyers. The only problem being that Tom had to find a way to recreate the bang which would add excitement to this sweet. After two years Tom finally discovered that if a strip of saltpetre, something that is familiar in today’s crackers, was pasted to two pieces of thin card at each end was pulled the friction created a spark and then a crack. He had to do much experimenting though because sometimes they burst into flames, thus ensuring Tom had a few burnt fingers. By 1860 Tom Smith had finally perfected his cracks resulting in his ‘Bangs of Expectation’ being born. Keeping the sweet and the moto inside but adding this noise gave his new confectionary a little more excitement which proved popular with the children and amusing for the adults. The buyers couldn’t get enough of this new novelty sweet and he became inundated with orders. Tom then began to refine his concept. He kept the moto but no longer placed sweets inside the paper, instead he added surprise gifts. Tom then renamed his new innovative novelties as Cosaques because the noise made was similar to the sound of the Cossack’s cracking whips as they rode through Paris during the French and Prussian wars. The Cosaques or as we know them today -crackers, were such a phenomenal success that Tom took the idea overseas. This wasn’t such a good move as one Eastern manufacturer stole his idea, copied it and shipped a consignment of crackers to Britain just before Christmas. Tom was horrified but wouldn’t be beaten so he set about designing eight different varieties of cracker, working day and night with his staff they were ready in time for Christmas and were distributed right across the country. After this there was no looking back as Tom was now the biggest manufacturer of Christmas crackers. When it comes to the serious business of collecting Christmas crackers there are a few key things that collectors look for. The design on the cracker and the box imagery is important, also what novelties can be found inside define much of the rareabilty and of course the obvious point that people only want boxed ones that haven’t been pulled. As with collecting anything condition is also important and the better the condition – i.e. not too much fading to the crackers or box, no tears and still with their surprises inside – the more money can be commanded. Throughout the Victorian period there were many themes to the boxes of crackers with Japanoserie being one of the most prolific. Inspired by the popular operas of the time such as Madame Butterfly and The Mikado these cracker boxes were decorated with images of Japanese Geisha girls and inside the surprises were miniature versions of Japanese pottery. 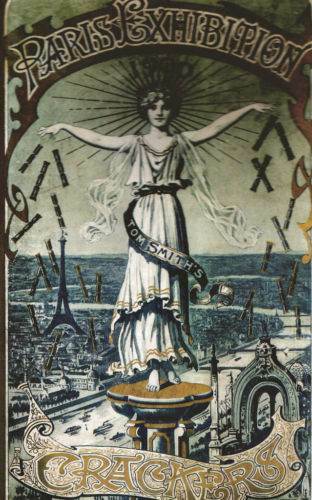 These Japanese inspired crackers continued right thought to the outbreak of the First World War and Tom Smith crackers often featured Oriental themes. Topical events were also often used such as the ‘Votes for Women; Suffragettes. There were two different boxed sets produced – the ‘anti’ packs which made fun of the women and the ‘pro’ packs which joined allegiance with the women as they were made in the purple, green and white house colours of the Suffragette movement. 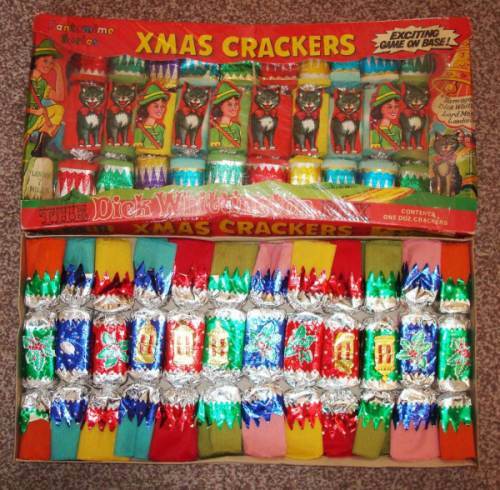 However, even if a few boxes of these crackers survived they would be near impossible to find as both collectors of Christmas crackers and those that collect Suffragette memorabilia would be fighting to own them. The early 20th Century brought a whole host of fresh ideas for cracker box imagery and the crackers themselves. On 22nd November 1922 the archaeologist and Egyptologist, Howard Carter discovered the tomb of Tutankhamen in the Valley of the Kings. On 16th February 1923 he opened the tomb and first saw the sarcophagus of this Egyptian King. This discovery fuelled the public’s interest in Egyptology and Tutankhamen ephemera were available everywhere – including on boxes of crackers, which contained miniature mummy cases. Another popular feature was depicting figures of Royalty. In the early 1930s a box entitled ‘Our Charming Prince’ by Tom Smith illustrated the future King, Edward VIII. The surprise contents also related to the prince as each crimson gelatine cracker contained either a small miniature busts of H.R.H, jockey cap, miniature stirrups, racing horses, motor cars and even cigarettes. 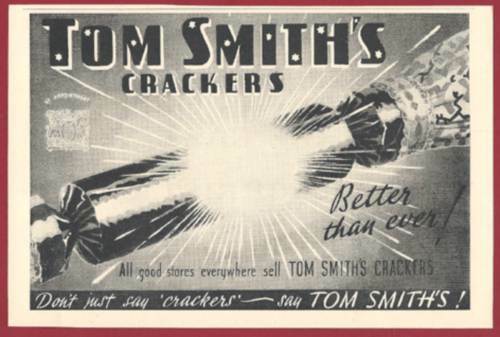 During the Second World War restrictions were placed on the production of crackers. Tom Smith was asked by the Ministry of Defence to fold and tie bundles of the ‘snaps’ together with special string and official regulation knots. These bundles were then used for training the soldiers in armed combat as when the string was pulled on the bundles the sound replicated gun fire. However, just before production was phased out the distributors Cecil Coleman Ltd sent crackers out to our brave ‘friends overseas’ for a ‘job well done.’ These boxes were more a propaganda exercise than anything else but the RAF to whom these crackers were sent each received an air force blue and silver bon-bon (cracker) which was decorated with a sticker of a Spitfire aeroplane. Today, these are highly prized, and any serious Christmas cracker collector would give anything to own one as they are incredibly rare. Things changed quite considerably after WW2 with Christmas crackers becoming plain and simple and it wasn’t until the Coronation of Queen Elizabeth II in 1953 that imagery on cracker boxes became popular again. 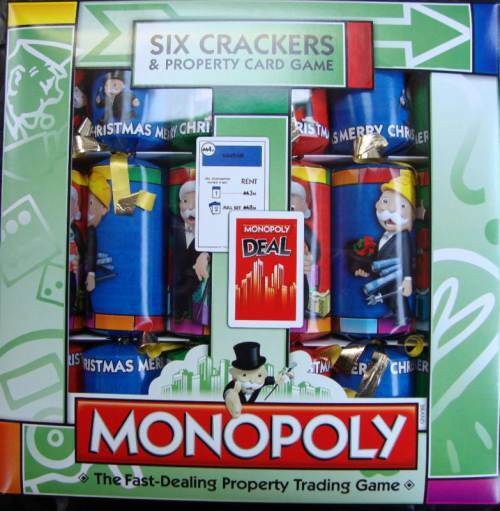 In recent decades there have been many different designs in novelty or themed crackers either focussing on a television programme, a well known personality or even blockbuster films. From the 1990s to date you can pretty much find a cracker to suit any taste. There are those geared towards gardening and wildlife enthusiasts, some are based on board games, whilst others stick to the popular television and film screen offerings. There are also still available the more traditional designs and those with festive character themes like Father Christmas, Nativity Scenes and snowmen. 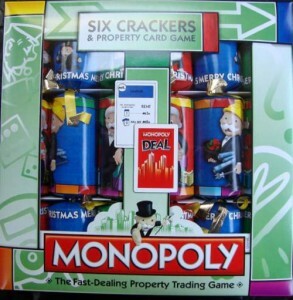 Aside from all the themed and luxury crackers, manufacturers have tuned into the needs of collectors and today you can purchase special boxes of crackers which are geared exclusively towards the collectors market. 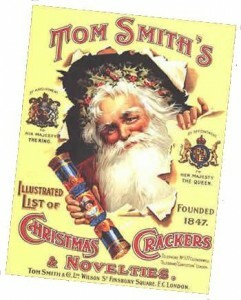 The British ceramics company Wade had a long standing tradition of supplying the surprise gifts inside special boxes of Tom Smith crackers. These gifts were in the form of small miniature whimsie figures which Wade have been renowned for producing since the figures were first unveiled at the British Industries Fair in 1954. 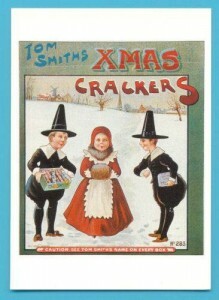 The first set of Tom Smith / Wade crackers were released in 1973 and were entitled Animate Crackers. This first issue contained a collection of eight Wade whimsies that had previously been created for the Red Rose Tea promotion in Canada. Although the figures themselves were not new onto the market the actual cracker idea was and thus proved a massive success ensuring that more crackers were released in future years. Soon to follow were Safari Park, Circus Animates, British Wildlife, Farmyard Animals and Nursery Rhymes in 1987. . These Wade/Tom Smith crackers continued to be a collectable success and right through to the end of the 1990s there were various themes such as the Village of Broadlands issued in 1988 and contained miniature houses. Family Pets was also a favourite in 1988 as was the World of Dog which held two exclusively designed models of dogs for Tom Smith. The Birdlife Series and the Snow Life Animals also appeared in the early 1990s and in 1994 Tales from the Nursery held ten models were designed but there were only eight crackers in a box meaning that two of the figures were harder to find ensuring that the collectablility went up as people desperately tried to find the two rarer models. The same philosophy was applied to the Cat Collection in 1996 and there are even rumours that different colour ways have been found in these particular boxes of crackers. Bear Ambitions joined the Cat Collection and then in 1998 the Hedgerow Party time crackers and Sea Life Party Time crackers were released. These were the last two sets of Tom Smith crackers to be brought out before the Tom Smith Company closed. Collecting Christmas crackers is an extremely enjoyable hobby as there is so much to choose from. There are those collectors who seek certain themes and others who source the rarer hard to find examples. Many people prefer to look out for individual makers such as Tom Smith whilst others choose those that have interesting collectables actually hidden inside the crackers. Whatever your preference this is an area of collecting Christmas memorabilia that is becoming more popular so perhaps when organising you Christmas table this year more thought will be given to the simple cracker and you might buy two boxes – one set to pull around the dinner table and the other to save for the future as certain modern crackers are sure to explode in price.